The best and most comfortable suspension on the market, comfy seats and soundproofing create a real cocoon sensation which makes you feel far removed from the strains of travel... Has your day been hard? CITROËN ADVANCED COMFORT® ensures that driving is always a relaxing time. Thanks to its panoramic glass roof and sunblind, Citroën C3's passenger compartment is bathed in a soothing light and really lets you take in the views... A new way to travel! 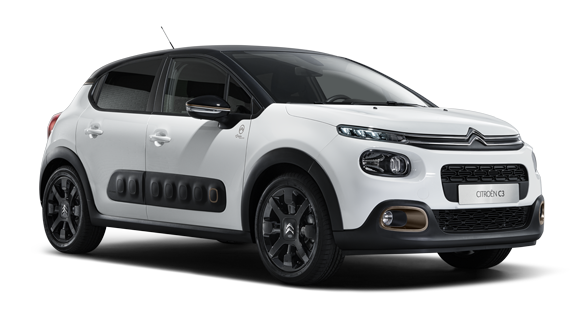 Citroën C3 is an extremely spacious city car, both in the front and in the rear. Its generous 300-litre boot space, 6.25-litre glovebox along with other storage solutions, mean there's plenty of room to store all you need for those spare time activitites, without encroaching on the comfort of the drive! The interior of C3 stands out thanks to its comfortable seats, the inclusion of luggage-style door handles and textile touches on the dashboard, available in 3 different ambiances: Metropolitan Grey, Urban Red & Colorado 'Hype'. Welcome to your mobile lounge!